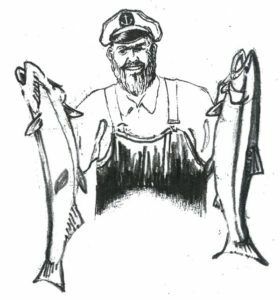 Salmon trollers supply fresh chinook salmon to markets. The boats vary in size from 18-foot day boats to trip boats up to 60 feet. Smaller vessels return to port daily whereas larger vessels might stay at sea up to eight days. A troller fishes for salmon by towing a number of lures or baited hooks through the water. Fishing lines are rigged to a pair of outriggers (trolling poles) three to six inches in diameter. 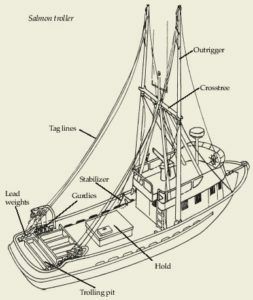 When lowered, the outriggers hold the fishing lines away from the boat. A type of wedge stabilizer (flopper stopper) might also be attached to each outrigger to help stabilize the boat. When not in use, the outriggers are held vertically by brackets secured to a crossbeam (crosstree) on the masthead. The gear is built to withstand the shock of hard-striking fish. Many of the vessels have a trolling pit in the stern so that fishermen can steer while operating the gear. Stainless steel lines are fished from each outrigger. Two to six lines are used, and each line is limited to four lures on monofilament leaders (spreads) attached at intervals of two to four fathoms (a fathom equals six feet). A 10- to 50-pound weight (cannon ball) takes each line to the desired depth. Fishing lines are set and retrieved using hydraulic gurdies (mechanical cranks). To spread out the lures and to prevent tangles, the crew uses float bags to float up to two lines per side behind the boat. The lures, which are barbless, can be fished from just under the surface down to 80 fathoms, at speeds of one to four knots. They include spoons, flashers, plastic or rubber squid (hootchies), and natural baits, such as anchovy or herring. Fish depth, troll speed, type of lure, and area fished all help to determine the number and species of salmon caught. Professional trollers can easily target the species they want to catch. Current fishing regulations protect wild Oregon coho, and so salmon trollers fish deeper to catch chinook. The fisherman uses the gurdie to bring in the fish. The fish is stunned, gaffed on board, bled, dressed, and washed before it is stored in an iced or refrigerated hold. Salmon trollers can fish up to 50 miles offshore. The season usually occurs from April through October. However, it is subject to changes and restrictions, depending on the condition of salmon stocks that year. Oregon's troll chinook is the first salmon on the spring market.